To enter to win The Big, the Bold and Blessings continue reading! We are so excited to show you The Big, the Bold and Blessings today! This is set is perfect for the upcoming autumn and winter occasions to express gratitude, welcome family and friends, thank hosts and hostesses, celebrate family and appreciate blessings. We think you will find this new addition to The Big, the Bold series so very useful and charming. Welcome to the July release! Lots of fabulous inspiration to come, and it is only day 1. 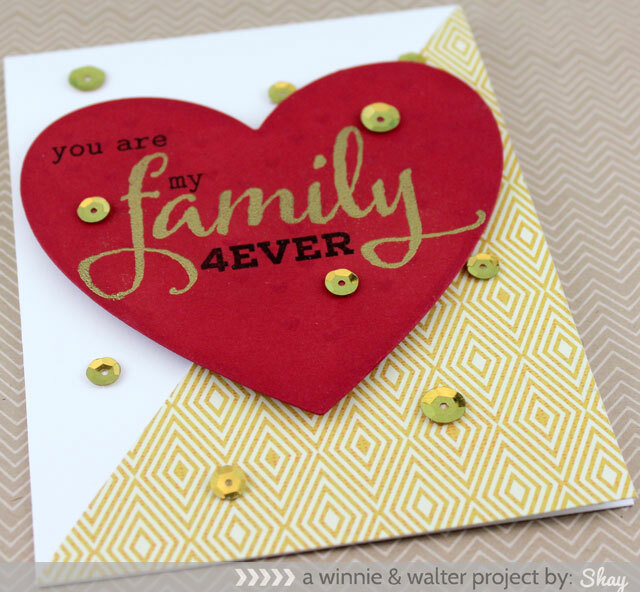 I have 2 projects today - the first is a thank you card that is simple and shimmery! I never have enough thank you cards, and I love the idea of this one. 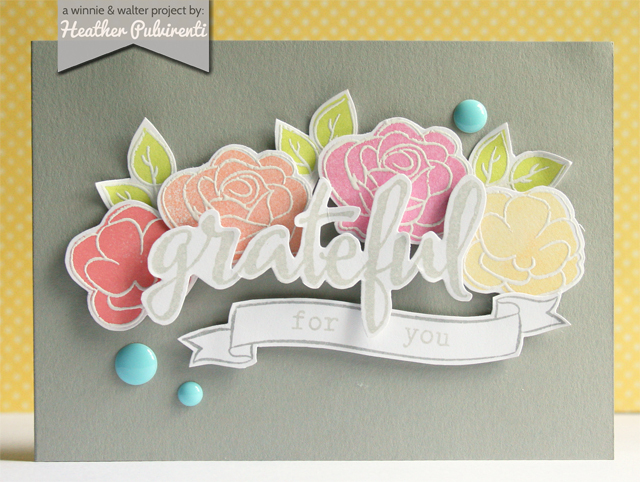 You could of course stamp the lovely "grateful" from The Big, the Bold and Blessings, but I wanted it a bit larger. I used the coordinating w&w digital files to cut the word at approximately 5 inches wide. Then, using the uber shimmery Heidi Swapp Color Shine sprays in primrose and mustard, I spritzed the word here and there to get a pretty gradient look. 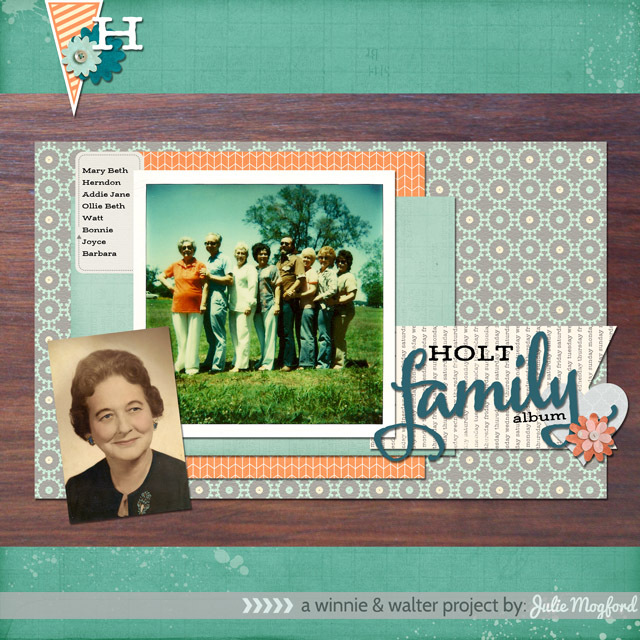 My second project is a digital scrapbook page for a project I will be working on throughout the year - a family reunion scrapbook. I wanted to create a sweet cover and I knew that the new "family" image would be perfect, but I am making this album mostly digital and maybe some hybrid pages. So, I turned again to my w&w digital elements and created this page. My first item to tackle was how to get these two photos to work on the same layout - it turns out the my Great Grandmother's jewelry in the photo is nearly the same shade of teal as in the color photo, so that was my jumping off point. I also knew I wanted to add some woodgrain, and I used the paper from our w&w daily grind collection of papers, and then scoured through my many digital collections to find colors that would work with the color photo. 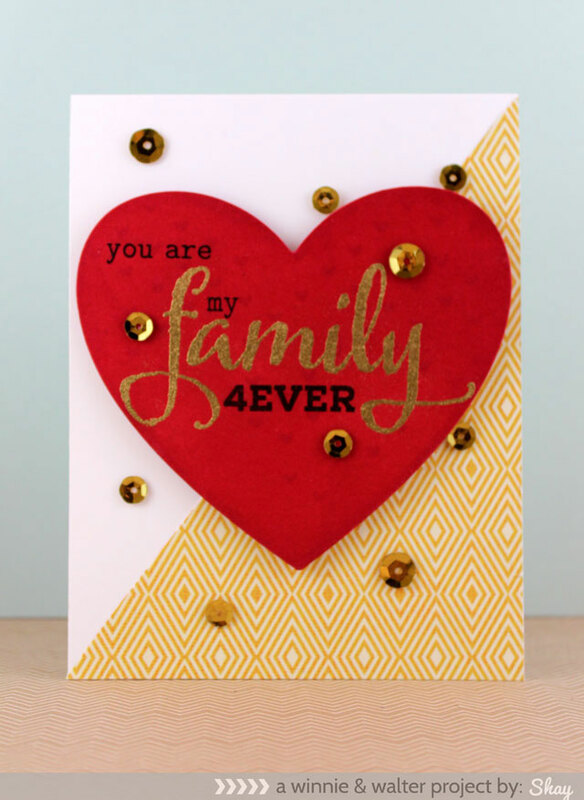 In this closeup, you can see the family title element is colored to coordinate with the photo but could also be masked with a digital paper, like the heart that is tucked under the y. That heart is from our The Write Stuff: Love Story digital files. 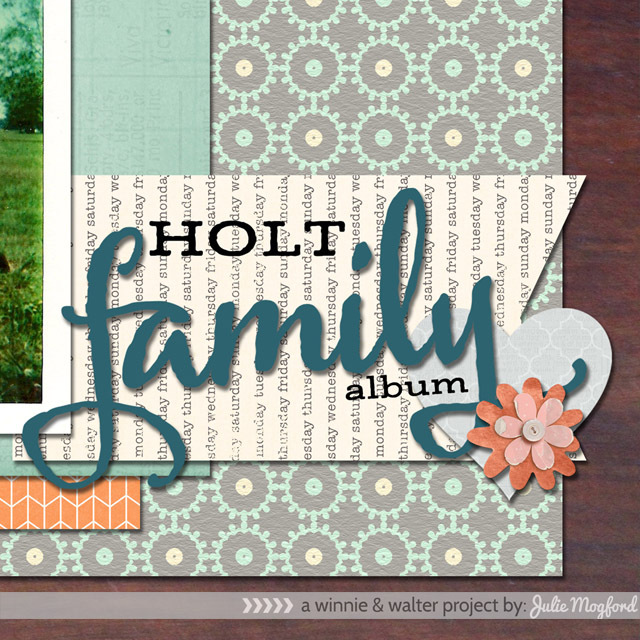 The font shown in the title is from Laura Worthington, Adorn Slab Serif. I made one more page element using images from tomorrow's set, Scenery: It's a Wonderful Pennant. I used the diagonal pennant, plus both the size 1 and size 2 solid pennants to create the whole element. 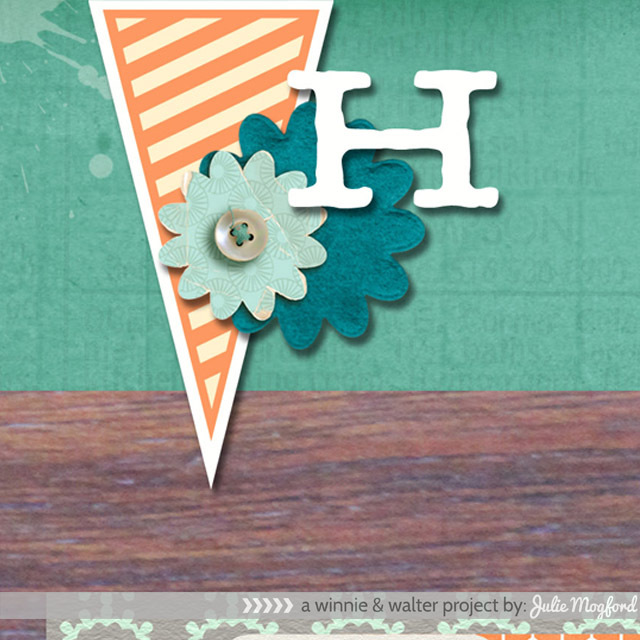 The H is in the same font, just typed in white and much larger, and set off with the contrasting felt flower. What I love about our stamp sets and coordinating digital files is that they both work well for scrapbooking and cardmaking. The sky's the limit! My first card uses "family" stamped in Versamark and heat embossed in gold from The Big, the Bold and Blessings and other little words from The Big, the Bold, and the Happy and The Big, the Bold and You stamp sets along with "4ever" from The Write Stuff: Love Story stamped in black to create a custom love message onto a die cut red heart from Lifestyle Crafts. I used pickled raspberry Tim Holtz Distress Ink with a mini ink blending tool with the falling hearts stencil from Simon Says Stamp and then with the ink blending tool edged the heart. I added the heart with foam dimensional adhesive to a card base that I added a diagonal half of patterned paper from Basic Grey. Last is some gold sequins, of course! My next card features the big "blessings" from the set. I decided to doctor blessings from The Big, the Bold and Blessings into blessing. I used tape to mask the "s" while inking up the stamp with Versamark and then removed the tape before I stamped. I stamped my sentiment using the little words from The Big, the Bold and You onto a panel of vellum with Versamark and heat embossed with white embossing powder. 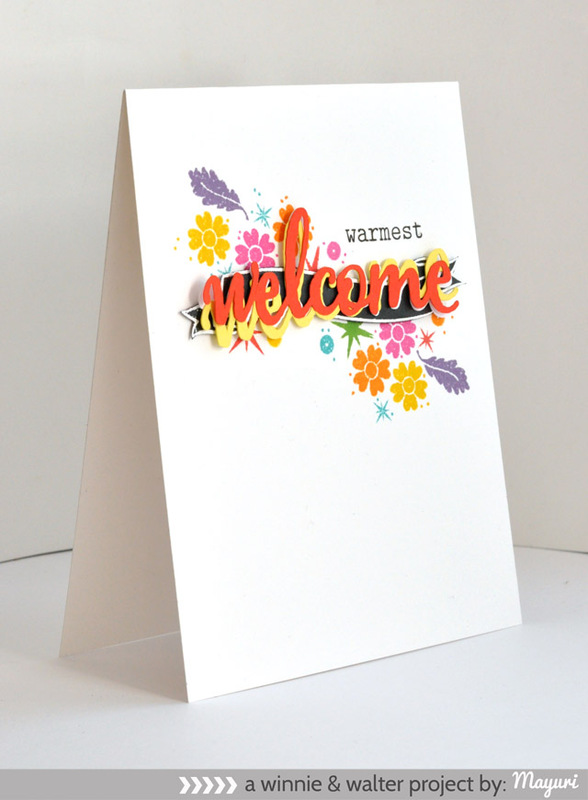 The floral panel is made by stamping the largest flower from The Write Stuff: Leave it to Mom repeatedly on a piece of watercolor paper in festive berry Tim Holtz Distress Ink. I used a water brush and extended the flower outside its original shape. I let it dry and then stamped the flower found in The Big, the Bold and Seasons (premiering later this week) into the center with red royal Hero Arts Mid-tone Shadow Inks. Originally I was just going to sew the vellum sentiment panel on the floral panel, but as I was sewing it did not sit flat so I decided to make a little shaker pocket instead by adding red and iridescent sequins. Last I edged the watercolor panel with picked raspberry Tim Holtz Distress Ink and adhered it to a white card base. 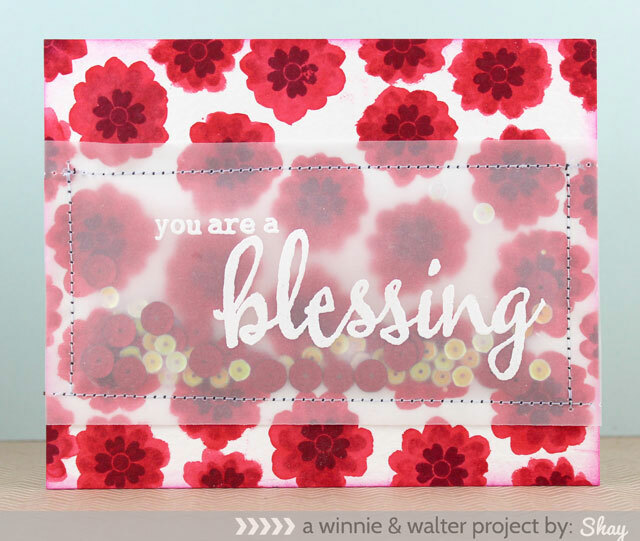 Comment here on this post for a chance to win a The Big, the Bold and Blessings stamp set of your own by 12:01 a.m. (central standard time) July 25, 2014. One comment will be chosen at random. Love all the projects shown here. Off to your shop. another big bold and AWESOME set! Wow, amazing talent in using this new set. I can hardly wait to get mine!! Looks wonderful for holiday cards!! I love the new words! The big words really make a statement on these wonderful projects. aww I so LOVE IT.. all of the samples are amazing and the script and sayings are just perfect..
Oh, I love this new set! Gorgeous! The DT has done this set some serious justice!! I love what I see! Thanks for sharing! Love this new set, gorgeous DT cards.. These projects are fabulous, love this set!!!! 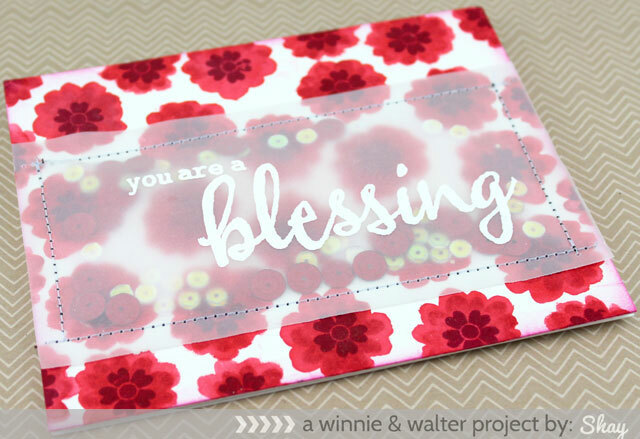 Just love that you included "Blessings" in this new set, and I'm swooning over Julie's card today! Can't wait for the rest of this week, and then to see all of the new sets revealed! WOW!!! Beautiful addition to the The Big, The Bold series!!! Lovely creations, great stamp set. I can't wait for the 25th! Another Awesome Big & Bold set! I love the words in this one! So versatile! And the Designers have rocked it! Love this set. So many ideas to use it on!!! I love bold sentiments. This set looks great! I have been loving this series of sentiment stamps. A must haves for my stash. Can't wait to get it! Lots of wonderful inspiration today ladies! Yay! I love these sets and the font! These sets are my FAVORITES and I can hardly wait to order them both! I have EVERY one you have designed so far and look forward to new ones with each release! Keep them coming!! Love this latest Big & Bold set! I have the first two so far. Thanks for the chance to win! Love this font so much...and the words you chose are just perfect! Blessings to all of you. The samples are fabulous! Looking forward to this new set of bold words with that awesome font! Love the projects made with this set. Can't wait to add this set to the two I already have. Oh my gosh! This is by far the most excited I've been about a release in a long time! I looooove all the projects and can't to see the full reveal! Oh, if only I could use the cut files =[ Do you think you'll ever offer dies? Love you W & W!! What a fabulous release. I just love your big bold words. The font on these is fabulous! Love all the inspiration! Amazing projects! Such a gorgeous set and wonderful inspiration. This is such a beautiful set...love those bold words and wonderful DT work. I'm so glad you are releasing another set like this. Everyone's samples are just gorgeous. I love those bold sentiment stamps. Designers, you all did a fabulous job. Love, love the blessings set! Awesome projects with them! Thanks! So many great projects and so many different techniques. These all look amazing and this looks like a very versatile stamp set. Looking forward to seeing more of your July release. I love all these projects! The new product is awesome, especially "blessings". I don't have any stamps that say this. Love! Wow! Fabulous projects DT! 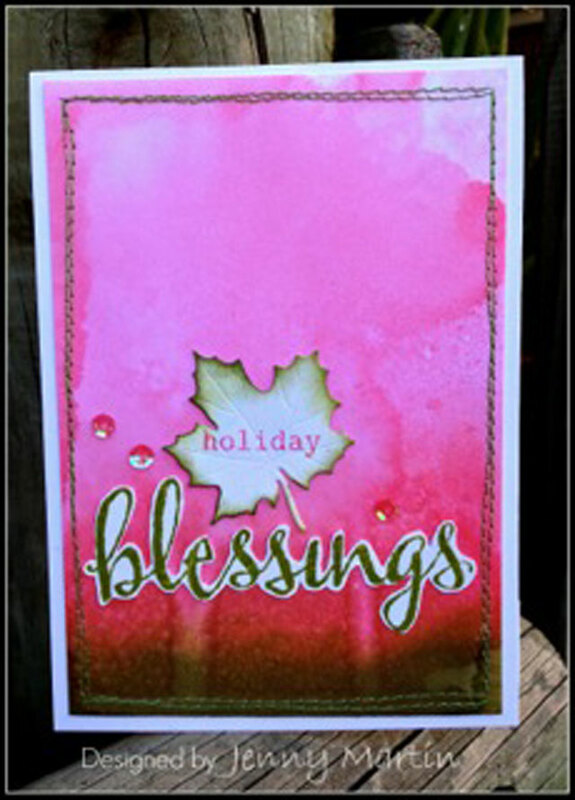 Love the new Blessings sentiments - can't wait to add this stamp set to my collection. Wow, what absolutely amazing projects! What a talented group of designers too! I am positively in love with the font on this set...so pretty and suitable for any project!!! what a great set of sentiments! Love these and all the ladies creations! just gorgeous! LOVE the Big and Bold sets already released, and this looks wonderful as well! What fabulous talent you have this month for your guests! 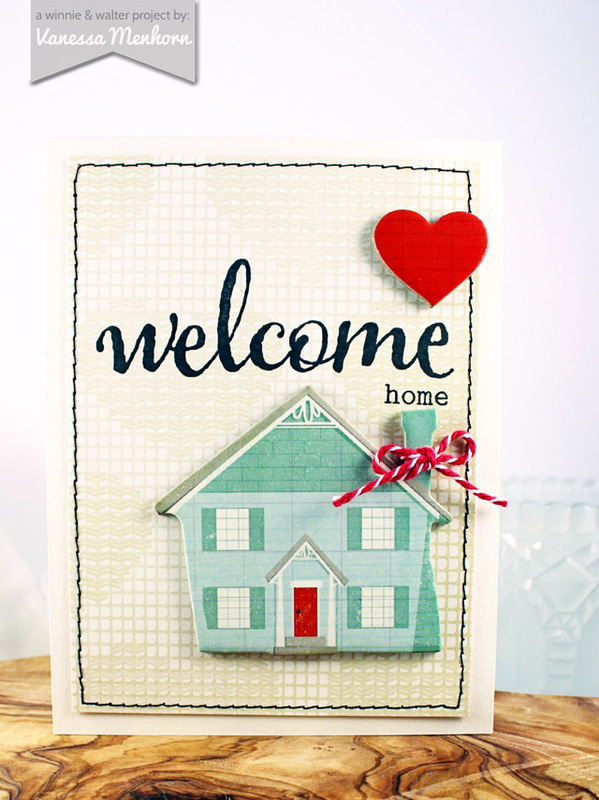 I am excited to see another sentiment set in this font from W&W!!!! Awesome stamps and creations, ladies!! I love the font you use and the larger words, they look amazing. I don't own any of your stamps so thanks for the opportunity to win some!! Really big fonts and gorgeous stamp set!!! Amazing job done using these new bold and beautiful stamp set!! Thanks for the chance to win! I always love your big fonts! Can't wait to see the rest of the release! I really liked the previously released Big Bold sets but this one by far is the BEST!!! Would love to win. Love all of you stamp sets! Thanks for a chance to win! I adore the big/bold series and I'm so excited about this new release. Amazing samples and I love the words you chose! I love these bold words. So very versatile and trendy. Wow, a set just brimming with possibilities - as certainly demonstrated by your incredibly creative team's showcases. Fabulous! Such beautiful addition to The Big, Bold series...Lovely! What great designs!! Love The Big and The Bold Series!! Blessings is a great addition! Love Shay's card. The big red heart on the yellow is wonderful. Love the second card with the vellum over the bright red flowers. (guess the red drew me in). All of the projects were amazing - those two just caught my eye. Thanks for showing so many beautiful designs. Fantastic projects showcasing this wonderful set! I love your Big, Bold series, so glad you added Blessings! Adore all "The big, the bold..." sets. Can't wait to add this one to my collection. Incredible cards by the DT today! Love all the big and bold sets and this one is a stunner! More sets that I *need!! Hooray for your new release!! Oh, these are fantastic. Love the words. I am LOVING all the examples the DT have shown...I can't wait to see the entire release! LOVE this new set! So much versatility! Wow, so many beautiful projects and great design ideas! Love how these big sentiments make such a strong impact!!! Wonderful set!!! CHRISTMAS TREES! I LOVE THIS. This stamp set is a MUST HAVE!!! Lovely sentiments. The Big,the Bold series is the greatest! LOVE the BIG words, LOVE the font, LOVE the small words and BEST OF ALL, I LOVE the FABULOUS projects it has INSPIRED!!! beautiful creations!! love the sentiments... gorgeous!! These are wonderful words. Can't wait to see all the small words which accompany them. So many fabulous cards.....I can hardly wait for the stamps to be on SALE! WOOHOO! Winnie and Walter has fast become one of my ALL time favorite Stamp Stores! THe BIg and the Bold line is my favorite!! If I only had a fraction of the talent the designers here have. Every one of these creations is fabulous. I particularly love the ones using the word "grateful". Such a wonderful release - my husband is going to shoot me! Wow - gorgeous projects by the DT. I am really loving the Winnie and Walter style of the beautiful large brushwritten words with lots of coordinating small words in the typewritten font. It's so versatile and useful and timeless!!! The projects are all amazing! 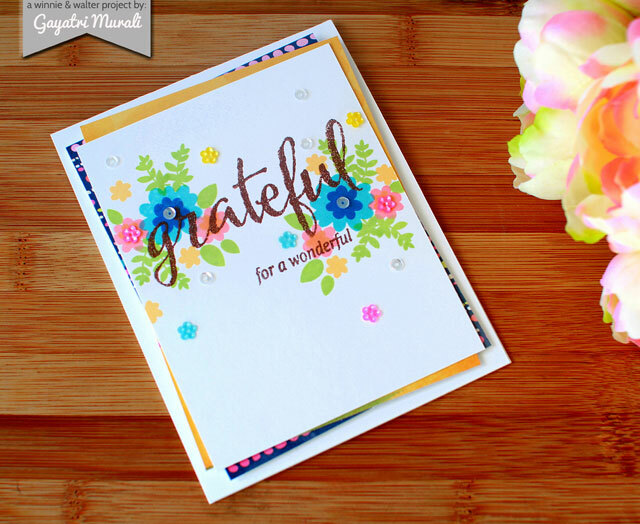 I love the grateful so, so much! I love this set! The words are so lovely! I would love to own this set-I could make such beautiful cards and layouts! All of the projects by the DT are amazing! Thanks for sharing! You are so tempting me to go back to card making, from being a dedicated scrapper! Oh my! This will go to my wish list directly! LOVE all the projects! Such a wonderful set! 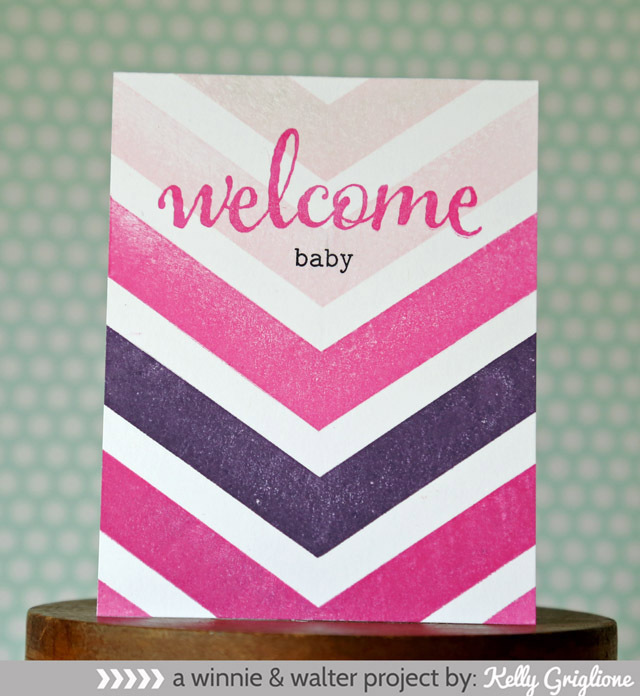 Perfect for scrapping or for cards!